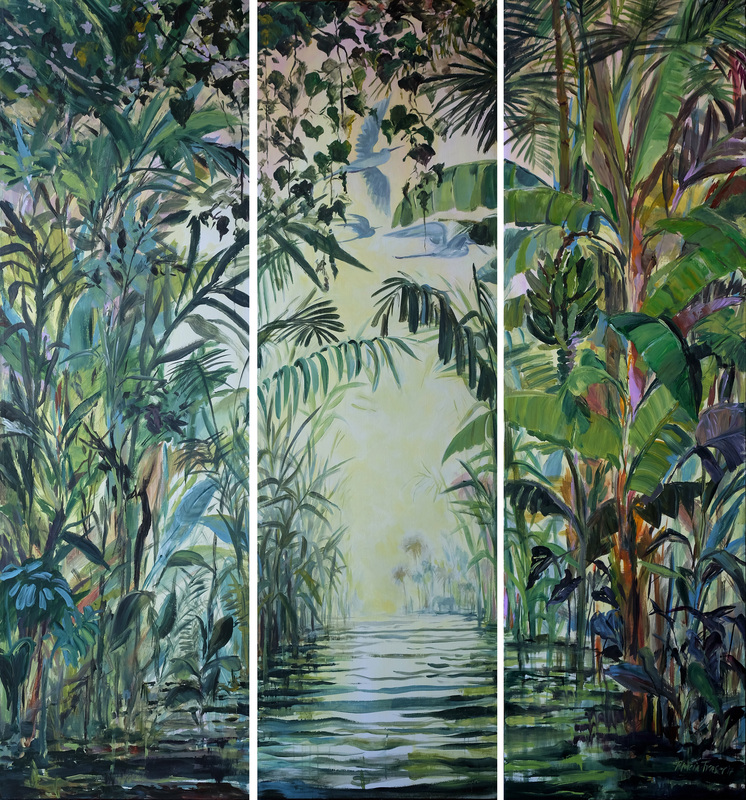 work done around lush foliage and water ways, inspired by a trip to Kerala in 2016. This title was inspired by the Poem by Anindya Mohan Tagore. Last month May I participated in two exhibitions. curated by Andrea Behnsen at The Project Room in Windhoek, Namibia. The work submitted is hinged on the my love of the landscape. When on a flight I am fascinated by the landscape- mountain ranges carved by rivers which meander across effortlessly, silver rivers reflecting the sun or the evening shadows cast across the deserts. The main piece was previously exhibited at the Hermanus Art Fair at Bouchard Findlayson. At the Voorkamer Gallery curated by Michael Chandler. Memories of Landscapes, reflections, and moments – these monotypes comprise my recent work – whether Watercolour or oil, the medium and process holds a fascination for me and love of paper work. I chose Flamingos for the Pink Exhibition at The Voorkamer Gallery for the month of December 2015/ January 2016. I had been observing them with fascination for many years. (Phoenicopteridae – Greek meaning purple wing.) Staying in the West Coast reserve at Church Haven in earlier years and latterly at Stoffbergsfontein on the Langebaan lagoon. I have treasured the sight close up of these beautiful pale pink birds as they make a nattering sound and even goose like honking while they communally feed and preen themselves. Continually moving until they rest beak under wing standing on one leg. Difficult to capture sketching. Other times you glimpse a flock of up to 50,000 on the far side of the Lagoon, a pale pink stripe on the far side and the magnificence of them in flight as their coral under feathers colour the flock. I am currently in love with the Monotype medium. Remerging Exhibition at The Voorkammer opened on First Thursday 3rd September. I am very honoured to be featured for the month of September at The Voorkammer Gallery , Chandler House. This exhibition continues with my passion and interest in lush vegetation of the North Coast of Kwa Zulu Natal forests. 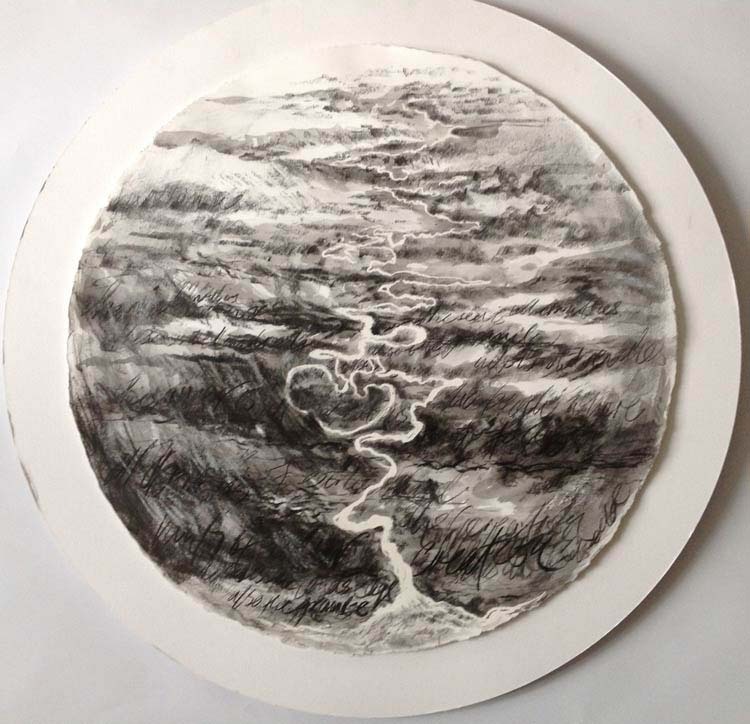 In the large work, Zinkwazi Milkwoods, the characteristic sea, rhythmically breaking on the the shore and its hissing retreat is the backdrop to layers of serpentine branches and thick lush undergrowth. The forests are alive with wild creatures great and small, timid and possibly venomous. The paneled painting evoking the sweet smell of damp composting forest detritus, crickets, cicadas and vervet monkeys chatter – all intermingled by a myriad forest bird sounds. These evoke memories of my childhood spent living in these surrounds. The potted plants portrayed in my Greenhouse series contain links to the memory of two grandmother’s nurturing and their plants which still grow on my potting shelf today. My attention is seized by the effect of light on landscape, trees and objects. The play of positive and negative. The refraction and distortion and merging of memories lost and explored. Resurfacing. Remerging.